Who is ready this month to win a complimentary scrub set from Barco NRG Scrubs??? Here’s how you can enter for a chance to win in Uniform Advantage’s UNIFORMS-ON-US contest! Barco NRG scrubs was designed to give our medical professionals flexibility and fit to move as their body moves. The pace of a healthcare professional is fast and constantly on the go and with Barco’s arcflex™ technology, it incorporates stretch and superior fit. You will get performance, style and functionality all in one package! Enter today and Win a scrub outfit for yourself! 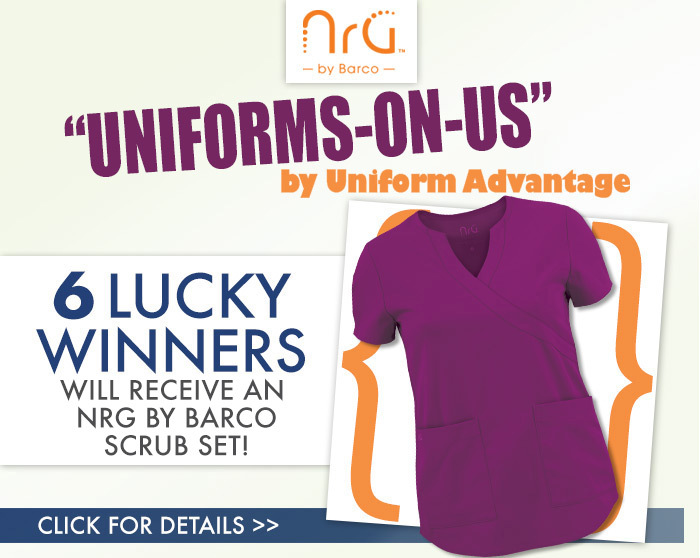 6 lucky winners will get this Barco NRG Scrub Set that includes a scrub top and pants offered on our website for free! 3. COMMENT on the Facebook post by answering this fun question: What is your #1 favorite Fall dessert you look forward to eating all year? Once all Facebook comments are in and confirmed that you shared our contest post, we will randomly choose 6 winners (using woobox.com), who will then receive a FREE Barco NRG Scrub Outfit of their choice. Click here for a preview. The contest ends Friday 19th September, 2014 at midnight and we will announce the winners Monday 22nd September, 2014 after 10 am EST on Facebook and our Blog. •Contestants who have won a Uniform Advantage contest within the last 6 months are not eligible to win. •Prizes will only be shipped to U.S. addresses due to varying international shipping rates and customs charges (you can enter as an international customer if you have a friend or family member with a U.S. shipping address that we can send your prize to). •Selected contestants have 3 business days to respond to their “winner’s facebook message” after which point they forfeit their prize to another contestant. Thank you for your participation and to Barco Uniforms for sponsoring! ← Happy Feet = Happy Healthcare Professionals! I do NOT use facebook and have NO plans of starting and I think it is unfair that I cannot enter your monthly contests because of this. It is discriminatory if you ask me. Congrats to our 6 Winners who entered our NRG By Barco scrub set giveaway!! *Please respond to the inbox message we will be sending to all of you today, with the required information. If we don’t hear from you within 3 business days, we will be picking an alternate winner. Thanks to all of our contestants who participated and to #BarcoUniforms for sponsoring our giveaway scrubs! Be on the lookout for our next Facebook Contest. Have a Fantastic Day! Hi Joan, our contests were specifically for Facebook as it was easy to monitor in one place. We understand where you are coming from and took your feedback into consideration. For future contests, we will consider all comments posted to our Blog Contests posts. Keep your eyes peeled to our Blog for the next one. Have a great day!